It is the culture or the inherent system that is to be blamed and not individuals. I remember in 1977 Sri Lanka was ruled by a political system which only could not turn a man into a women. Since then every benevolent ruler who has sat at the helm has tried his or her level best to live up to that concept, and the only result that it has yielded is the politicisation of every movable and immovable object within the peripheries of this resplendent island. Yet, one cannot run away from the status quo. At one juncture, when Sri Lankan cricket was struggling as an affiliate member of the world cricket body, it was a politician who took the bell and hung it on the cat. Though it was done by a politician it was a different scenario which cannot be explained that easily, because the politicisation did not seep down to the core like the light shower that stopped an international cricket match at the Sydney Cricket grounds recently. The curator aptly put it across: “The shower was too light to seep through”. From this end we transcribe the politicisation at that time was too light to affect the conduct of cricket at the bottom. Today we feel that the concept is different. If you want to be anything of substance, you have to be affiliated to the proper political party. For instance, former Sri Lanka captain Arjuna Ranatunga did try to contest the Sri Lanka Cricket elections, but, failed miserably. Then he took up politics, which is his family trade. He was elected to parliament with a huge majority. Yet, it was a definite political tumble that brought him to the hot seat of cricket in 2008. Though even as a politician he was not given any authority on sports, it was a crafty political gimmick that finally thrust him upon that seat. That is cricket in Sri Lanka. Initially when Arjuna tried to get into the cricket administration the man at the helm was Thilanga Sumathipala, who is as passionate about the game of cricket as Arjuna Ranatunga is. Yet, Sumathipala did not have the freedom to bear the full benefits of his tenures at the chair after Ranatunga had sought refuge in the political oasis. Then after a while we found Sumathipala himself joining the political bandwagon and ready for the game of cricket chess. That is one situation that is always there among the cricketing cinders. These are the manoeuvres that made the political juice seep down to the core of cricket. Then came what was once thought to be everlasting Interim Committees. If the ICC did not bring in legislation the ICs would have continued. The then perpetual ICs paved the way for the political businessmen and acolytes to make it their Day of the Jackal. At this point the bottom caved in. Then under pressure from the ICC, a so-called elected body was placed at the helm of cricket. Yet, the ones who were elected and the ones who are aware of the core of the system know it was only a crafty ‘doosra’ to beat the ICC stipulations. Maybe the stakeholders also have a say now, but the ‘tiger’ at the helm has not shed its stripes. The stagecoach runs on unceasingly with its scheduled stops. Now, in the latest move, the Minister of Sports, under the powers vested in him through the Sports Law of the country has instituted Parliamentarian Sanath Jayasuriya as the Chairman of Cricket Selectors. Like some of the other incidents discussed before the biggest qualification for the Jayasuriya appointment was his political affiliation. 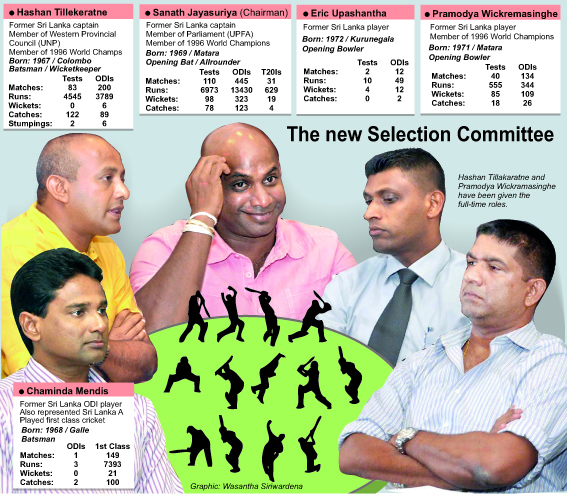 Jayasuriya replaced the selection committee led by Asantha de Mel who had yielded results. Under his tenure, the teams picked by him had reached two ICC finals — in 2007 and 2012. There are experts who still talk about the achievements of de Mel. 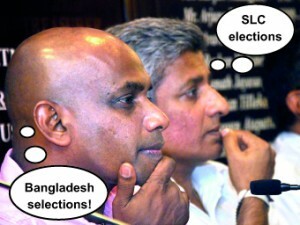 Even SLC secretary Nishantha Ranatunga did mention this when he addressed the media on Wednesday. Then why change? Couldn’t it be that in this cricket board election year a crafty individual played a game of political chess to safeguard his own position in the cricket administration? The same even happened to Julius Caesar at one point of history. In this dirty game of cricket administration there is a chance that your own shadow may stab you at the back. Coming back to Jayasuriya, he has played the game at the highest level and is well aware of the intricacies of the modern day game. But we, at this end, are not confident he has the maturity that is needed to forge ahead in this capacity. We are aware that in any organisation there are people with different views and aspirations. A cricket team is no different; especially when it comes to a bunch of professionals whose ability only keeps them in their positions. However, the stage may need more curtains because the in-fighting can sometimes get ugly and spill on to the streets. As a cricketer Jayasuriya spent his sliding stages of international cricket with some of the players who are still in the circuit, such as the likes of Kumar Sangakkara and Mahela Jayawardena. There were certain moments when all the curtains were insufficient to hold back the stench that emanated from the dressing room in that era. Once such incident led to the abdication of Mahela Jayawardena, who had led Sri Lanka into the Cricket World Cup finals in 2007. The cricketers know these incidents and so does the new Chairman of Selectors. This is what we fear. What happened at that stage must be left among the skeletons and bygones. Sanath Jayasuriya must prove that he is capable of going beyond those differences that erupted over natural causes. Jayasuriya in his inaugural press chat on Wednesday said that he would be impartial, but reading between the lines he said a lot more. How do we take the utterances of a politician? Or else did he mean these words earnestly. Only the future holds the right answer. We are aware that Sri Lanka Cricket is making an effort to enter a new phase. They are bound to have a new captain/captains in the middle. A new CEO shortly will be running the administrators. A new selection committee is there with a new chairman. Yet, the crux of the matter still remains the same: The game runs according to the whims of the puppeteers who hide behind the curtain. At least let this new beginning give a new light to this prevailing darkness. Or else please be kind enough to change the name of SLC to ‘Government-run Sports Undertaking of Sri Lanka Cricket’. Maybe then they have co-opted the members through the ‘Manapa system’ at the Parliamentary elections. Then it will be mandatory for every national cricketer to become a politician if they wish to continue in the game. PS: While driving to office today the radio played a heart rendering version of ‘I’ll stand by you’ – it was sung by the Pretenders. I rest my case. Is Kandy’s school cricket on the skids?